TENEMOS UN BLOG Y... ¡¡¡BUSCAMOS BLOGGERS!! The Mk5 Café Racer combines the memories of the golden era of motorcycles with the engineering of the modern era. 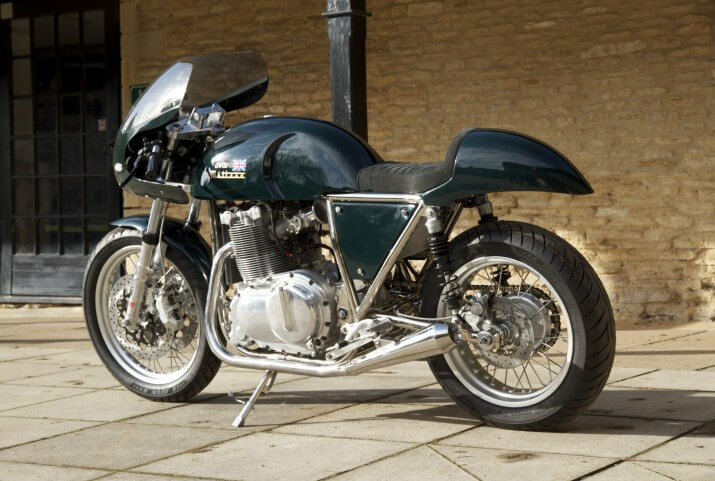 As with all Mk5 motorcycles, the Café Racer uses Metisse's own engine ' the Adelaide' to great effect. The unique engine is showcased in the Metisse trademark nickel plated frame, with all of these parts hand crafted and assembled in the Carswell workshops. The classic Café racer styled bodywork then gives you the option of having a top fairing or not. As with all Metisse motorcycles it is not just about looking good. The underslung clip on handlebars, the tailored riding position, the adjustable suspension and powerful parallel twin engine all give you the ultimate riding experience for when you want to stop admiring the motorcycle... and ride it. Rock & Roll Is here to STAY!! Página generada en 0.074 segundos con 20 consultas.